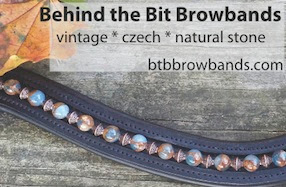 Behind the Bit: Brown tack in dressage part II: Whither the brown girths? Brown tack in dressage part II: Whither the brown girths? Brown girths aren't all that easy to find. It's a pain to search for them, because many companies don't include the girth color in the descriptive text -- it's either assumed to be black or the option for brown only appears in the dropdown menu when you order -- which means it isn't searchable. Harrumph! Here is what I found looking through online tack stores. Bear in mind that girth manufacturers may make a brown girth that tack stores don't stock. Note: I'm told that the emergence of monoflap saddles in other disciplines have made brown girths easier to find, but I didn't specifically search for non-dressage girths. On the low end we have the plain Wintec elastic dressage girth from Horseloverz for around $40 (also available at Crazy Horse Tack and Carousel Horse Tack). Libertyville Saddle Shop has the Regent-Lonsdale girth currently on sale for under $30, and the Jeremy and Lord Two Buckle Elastic End girth for $40. In the midrange, the Nunn Finer Passage girth from Bit of Britain is my pick for an attractive, reasonably priced (around $100) brown girth. Dover has a Double Elastic Dressage Girth for under $100 but I don't find it very appealing. Adams Horse Supply sells the Toklat Coolback dressage girth in a variety of colors, including brown, for under $100. Libertyville Saddle Shop has the Equibette girth for about $90. The Show Barn LLC has a Toklat dressage girth (brown with white fleece) for $85. Horseloverz has the M. Toulouse monoflap dressage girth for about $100. The Ebay store Wholesale Equestrian Outlet has the contoured Delfina girth for about $90. Thorowgood makes a synthetic dressage girth in brown. It's popular in the UK but hard to find in the U.S. -- try Ebay. The Barnstable leather girth with double elastic is about $100 from Harmony Farms Saddle Shop. At the high end, there is an Amerigo girth, available from Smartpak and other stores. Dressage Extensions has an Otto Schumacher girth for $210 and a County Logic girth for $220. Bit of Britain sells a Mattes shaped girth in brown and sand for $220. For about $180 Dressage Extensions sells the Karl Neidersuss straight girth and a Karl Neidersuss contoured girth. VTO Saddlery sells a Prestige Contour girth for $150, but the color is tobacco (fairly light). The Thinline stabilizer girth comes in several shades of brown and runs about $170, while Laser makes a dressage girth in brown for $160. Horseloverz has the elastic Wintec girth with CAIR in brown for about $150. If you know of a source of brown girths or tack in general, post a comment -- thanks! I searched for months to figure out a good girth for my horse. I was willing to spend quite a bit, because he was very girthy when I got him. It was believed it came from his start as a racehorse and that it would never go away... but since I got the Prestige girth you showed there, the only girthiness issues he's shown have been on super crabby days where he randomly pinned his ears at wind, other horses, or a request to do anything but stand still. To me, if I were in a brown saddle - that would make it worth the possibility of a color mismatch! As always, you are a wealth of information. Though I am not in the market, I really appreciate your research. Thanks. The only girth that I have personal experience with, is the Wintec Elastic Dressage Girth. They are good. Long lasting and have never galled my horse even when he was in really soft condition. He is a very fine coated Thoroughbred. I can most definitely recommend them. If you can afford it, and if they are available in the USA, they also have a more up market Cair Wintec Dressage Girth that I haven't tried yet, but would like to. ...and for your bridles post! Laser makes a very nice girth that is available in brown. Schleese makes brown dressage girths that are very nice (but expensive). I've had my first for over 10 years and it is going great. Another one is slightly newer, but also good. Wow! Your girth research is so thorough! I would like to second the Prestige Anatomical girth in tobacco. I treat this girth like a treasure, especially since it cost about as much. This girth has made my horse so much more comfortable and I no longer have to place my girth alarmingly far back to prevent the saddle from being pulled into his shoulders. Worth every penny!